Join us from 5:30pm to 8:00pm for a Martinis & Mistletoe themed night, with heavy appetizers & libations at LEX Lounge at The Grand Sierra. Hosted by: AAF, AIGA, PRSA, PSN & Reno AMA. Communications and creative professionals from around the region get together every year for Mingle Bells, scheduled for Thursday, Dec. 8, 2016. Mingle Bells is a holiday networking event for advertising, public relations, communications, marketing, and sales professionals designed to facilitate strong relationships and celebrate the close of the year. Event organizers asked the non-profit community to apply as beneficiaries, as the event typically raises about $2,000 through admission prices and raffle ticket sales for one lucky local non-profit. In 2015, proceeds from Mingle Bells benefited Aiden’s Gift in the amount of $2,001.18. Aiden’s Gift raises money to provide equipment and resources to special needs children and their families. 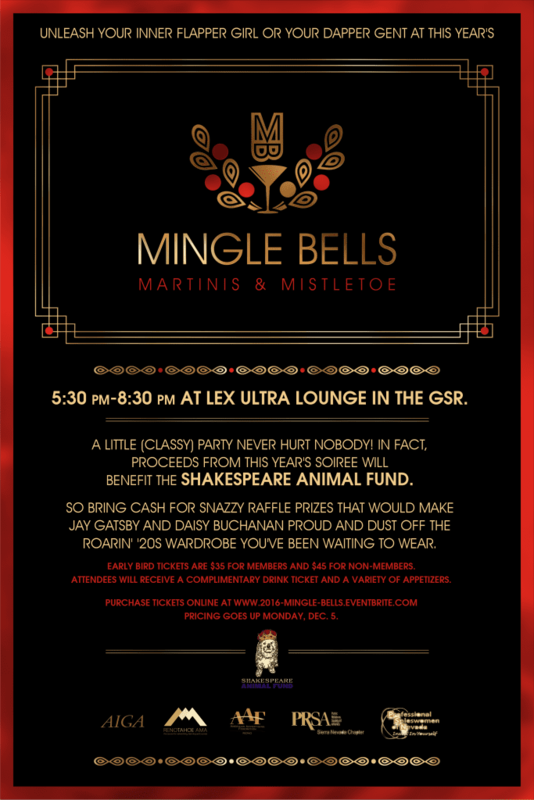 This year we hope to raise even more for the SHAKESPEARE ANIMAL FUND. Mingle Bells 2016 will be at LEX Lounge at the Grand Sierra Resort and Casino.